By the time I came to grips with the notion that I was sitting in a boat only a few inches wider than my hips, and just a few inches above the water, we were already in the middle of Dillon Reservoir. The two-man racing oar boat I was sitting in made my own whitewater kayak feel like a Buick in comparison. We’d glided out there with what seemed like just a few effortless oar strokes. In front of me Frisco Rowing Center club member Hans Wurster was calling out instructions, all while correcting and compensating for my rowing shortcomings. “Keep your oars on the water,” he said, over and over again. It felt odd not to lift the nine-foot oars up, but rather angle them and let them bounce off the water as I set up for the next stroke. “The oars keep us balanced,” Wurster reminded me, implying that we could tip if I didn’t keep them on the water. It turns out rowing a crew-style boat feels a lot different than rowing a raft or a rowboat. Trying to find a rowing rhythm was harder than I’d anticipated. Every time I pulled a stroke without an oar properly angled I felt a little like a fish flopping around helplessly on a dock. “Don’t look at your oars, look straight ahead at my back,” Wurster said. It seemed that he sensed my mistakes without even being able to see me. When I did occasionally fall closer into rhythm with his oar strokes, the appeal of rowing became clearer. I could imagine the feel of smooth rhythmic motions and a boat cutting through the calm, flat early morning waters of Dillon Reservoir. Other club members talked about how frequently they see eagles and ospreys fly just overhead during a morning excursion. One member mentioned witnessing ospreys fighting for a fish with an eagle. But by the time we made it far out on Dillon it was nearly 10:30 a.m. and, right on schedule, the winds were starting to pick up. Almost immediately I could see why the rowing club gets off the water by that time. We weren’t looking at whitecaps but the water was getting choppy. Wurster turned us around and we made our way back to shore. While I didn’t have the pristine morning ride that club members speak so highly of, I could see the draw of early morning rowing sessions on Dillon. Equally apparent was the bond among club members. Wurster described the Frisco Rowing Center as close-knit social organization, welcoming to new members and those who have never rowed before. Club president Joanne Stolen also mentioned how the club even gets together in winter. After they pack the boats away for the season, a number of club members switch over to cross-country skiing and organize activities like full-moon ski trips and dinners. On Saturday, the club hosted an open house and breakfast, inviting anyone interested to come give rowing a try. 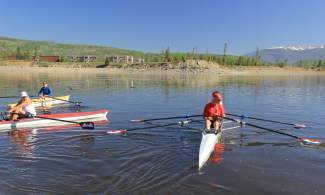 Club members provided instruction on land-based rowing simulators, then in boats on leashes held by coaches on the dock. Wurster and a few other members also took some guests out on two-man boats to learn some basics and give them a feel for being farther out on the water. “It was really different than what I thought,” said Val Butler of Silverthorne. Stolen had been trying to get her out in a boat for a few years, and Butler finally had done it. The club is open to all ages and abilities. Members include retirees who have settled in the area, Denver residents and second-home owners. Ability levels range from those in the club who just picked up the sport in the last few years to those who travel to compete in races. There are even two former Olympians who are active members. The club offers lessons and rowing programs. Sign up for a single lesson or a four-session package of hour-and-a-half lessons before joining the club. Club members also offer a free adaptive program for those with physical disabilities. Members have full access to the club’s fleet of boats, which are available every morning and can be reserved online. The club will host another open house in two weeks, on Saturday, June 29.